The legacy of aikido is a spiritual gift for humankind that fills hearts with love for the art and joins forces of people from very different places and cultures. The tree of aikido has many branches yet a single common trunk and roots which reach far back in time and in the depth of spiritual values that are ​​universally valid. However, what once was just a seed, could never have given such a result by itself. In fact, thanks to a life dedicated to the development of this art through rigorous training, his direct students formed groups that, with commitment and passion, make this modern yet traditional type of practice, alive and vibrant for the contemporary man. From the outside, aikido appears as a martial art with very characteristic spherical movements that are both powerful and dynamic, which aim to neutralize the attack without useless opposition or violence. 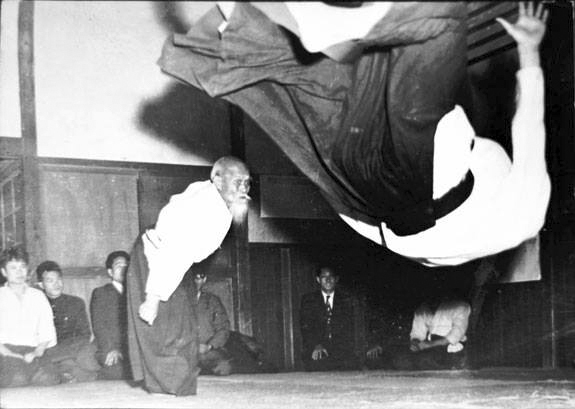 However, the inner experience of aikido is in many ways similar to that of Yoga; in fact “Aiki” and the Sanskrit root “Yug” refer to the same movement toward the union with the Absolute. During practice you find yourself inside an actual meditation path, where the study of the relationship with the other and of oneself takes place simultaneously and on the three planes: physical, mental and spiritual. This is why aikido is a powerful tool for personal growth that naturally complements and enriches paths of awareness and art forms both Western and Eastern in nature. The degree of intensity and depth of practice grows over time, so that we can think of this path as a journey, an adventure of the spirit. Aikido helps us to develop the vehicle (ourselves) and gives us helpful suggestions on how to best use it to meet the everyday challenges with an alert and mindful attitude without being tense; it shows us how to be strong without being violent, gradually learning to disengage ourselves from behavioral reactions dictated by automatic reactions, towards the conquest of a simply free state of being.